OK, this is too cool - apparently puffin beaks fluoresce! Particularly given my recent foray into fluorescent sculpture and my mixed media acrylic series on Atlantic puffins, I'm feeling inspired to perhaps make a fluorescent puffin of my own soon...! Here are some images of the show! I got sidetracked by an alumna when I was walking around photographing so I haven't taken pictures of the whole of the show yet, but that just means there's more to experience if you want to stop by - the show's up through the 15th. An image of my wall of artwork from the exhibition. Looking at my wall from the other side. December 9-15, 2016, 10am-4pm with an opening reception today from 3-5pm - complimentary refreshments will be served. If you'd like to join us, Goppert Gallery is on the ground floor of Xavier Hall on the University of Saint Mary's main campus found at 4100 S. 4th Street in Leavenworth, KS. Here's the full press release if you're interested, though since we sent it out we've changed a few details so this post has the most current information. I'll upload some photos shortly! And here's the finished first painting! It's a conceptual, experimental piece - those are real Atlantic blue mussel shells (Mytilus edulis) adhered to the panel; I beachcombed some while I was in Iceland and was quite interested in their coloration and form and how I might use them to break the picture plane. I wanted to explore ideas of illusionism, perspective, shaped or irregular canvases, cast shadows, organic versus architectural form language, and intertidal zone ecosystems. I'm titling this painting Byssal Bird, and it's a mixed media piece with acrylic, watercolor, Atlantic blue mussel shells, and epoxy on a 16x12" basswood panel. I'm almost done with the first puffin painting - the one I gave you a sneak peak of - but in the meantime I'm potentially done with the second; I've been adjusting it over the past couple days and I may go back into it again, but here's where it's at now. If I do go back into it, it'll be for minor changes at this point. I'm typically pretty bad about taking progress photos (particularly in taking well lit/consistent lighting source ones, so please excuse the slight lighting changes in the thumbnails) but I'm trying to make more of an effort to document my processes. I'm titling this one Littoral Layers. The final piece is graphite, charcoal, and acrylic on a 16x20" basswood panel. I typically do start with a line drawing (after preliminary sketching, of course), but then in paintings where I add to the natural support media for the background, I usually paint in the beginnings of a background before moving on to the foreground elements and then go back and forth until there's a resolution. This painting was different in that I really developed the foreground elements before addressing the background, though after that I did my normal switching back and forth routine. New Series Started - Puffin Paintings! 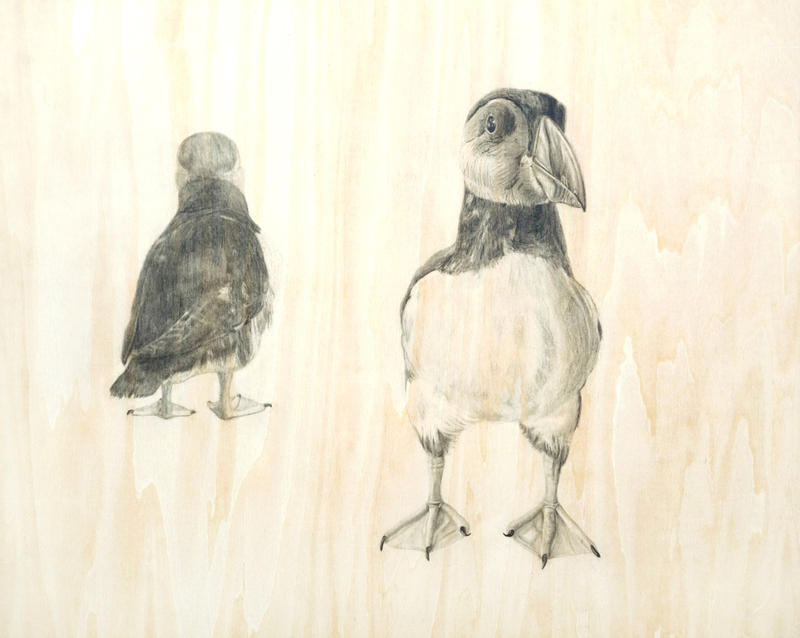 I've started a new series of paintings on the juvenile puffin, Toti, that I met at the tail end of my residency in Iceland in 2014. Toti was a puffling that failed to launch and imprinted on humans, so he is now a permanent resident at the Saeheimar Aquarium. I wanted to start on these pieces sooner, but better late than never. Here's a sneak peak of progress on the first painting!